How Much Does it Cost To Fly To Los Cabos? The cheapest flights to Los Cabos found within the past 7 days were $95. Prices and availability subject to change. Additional terms may apply. Love Field - Los Cabos Intl. Dallas-Fort Worth Intl. - Los Cabos Intl. Head to Los Cabos if you want to strip away all inhibitions and throw caution to the wind. There's no better place to do it than in this majestic Baja California destination. Everything about this municipality is exhilarating, from its crazy party scene and stunning rock formations to the majestic Pacific Ocean that welcomes you. You'll feel more alive than you have in years when you're about to land in Los Cabos International Airport (SJD). If you need a momentary escape from work, you should book one of the flights to Los Cabos; you have full permission to go crazy for a time to regain your sanity. 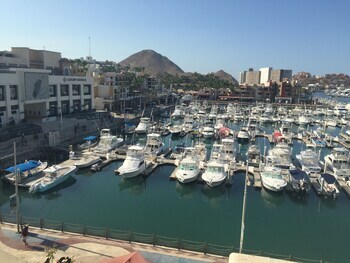 Staying in one of the hotels near Los Cabos International Airport is an excellent arrangement, as it puts you mere minutes away from the downtown area. You won't find public transportation that serves the airport, so you should arrange airport transit when you book your airline tickets; you can opt for a shared or private shuttle service to take you to your destination. Car rental companies also abound in this side of Mexico; a car rental is the perfect option if you don't mind cruising along on your own to Los Cabos beaches, bars, and shops. If you're feeling adventurous, you can even head north, explore the road less traveled, avoid swarming tourists, and check out travel delights like Cerritos Beach and Todos Santos. You wouldn't want to miss anything while you're in this tropical paradise. To ensure your vacation is jam-packed with deals and great sights, it makes sense to avail from one of the bundle vacation packages to Los Cabos. Travelocity can help you find cheap flights to Los Cabos, low hotel rates, and reasonable transportation arrangements to get you the most bang for your buck. With money to spare, you'll have a grand time with the treasures of this paradise. Question : Where can I find cheap flights to Los Cabos? Answer : We know you’re looking for the best flights at the lowest fares, so we found some of the sweetest deals in town just for you. 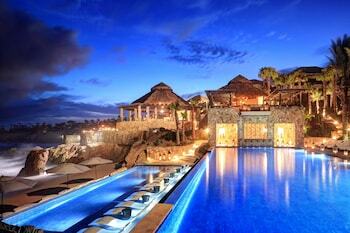 Check out the top flight deals to Los Cabos. Act quickly and score yourself a bargain! Delta has a flight from to Los Cabos departing on 4/16/19 and returning on 4/20/19 all for only $237.00 per person. * Book these Delta flights! Alaska Airlines has a flight from to Los Cabos departing on 4/19/19 and returning on 4/23/19 all for only $361.00 per person. * Book these Alaska Airlines flights! United has a flight from to Los Cabos departing on 4/16/19 and returning on 4/20/19 all for only $479.00 per person. * Book these United flights! Question : What are the most popular airlines that fly to Los Cabos? American Airlines Flies 95 flights per week between and Los Cabos. United Airlines Flies 93 flights per week between and Los Cabos. Delta Air Lines Flies 77 flights per week between and Los Cabos. 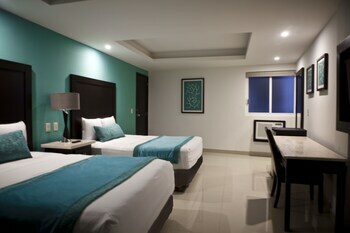 Question : Which hotels are located near airports or major attractions in Los Cabos? 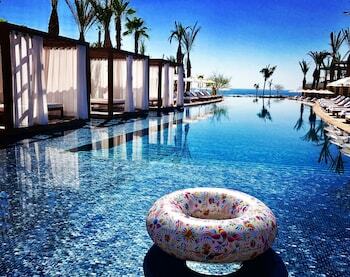 Answer : We've put together a list of hotels in Los Cabos close to airports and popular sights to see. Check out the hotels below. 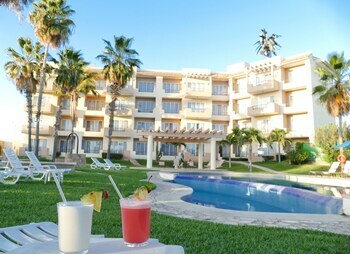 All of them are within proximity to must-see attractions and major airports in and around the city of Los Cabos. Sandos Finisterra Los Cabos All Inclusive Resort: Relive the legend of the Sandos Finisterra All Inclusive Resort in the heart and soul of Cabo. 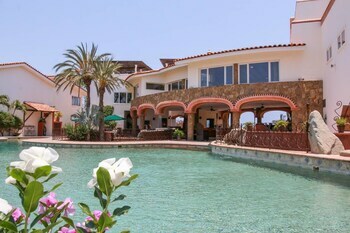 Located on a large beach, enjoy views of the Pacific Ocean or the Marina and Bay. Walking distance to shops, nightlife, restaurants and water sports. This hotel has a 4.00 star rating. 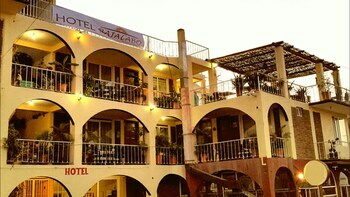 Playa Grande Resort & Grand Spa: Facing the Pacific Ocean, this village-like resort lies along a vast scenic private beach, less than 2 km (1 mi) from downtown Cabo San Lucas, marina, the exciting nightlife and shopping distric. This hotel has a 4.00 star rating. Riu Santa Fe All Inclusive: Resort is located along the renowned Medano Beach with spectacular views of the Arch at Land's End. Downtown Cabo San Lucas, shopping, restaurant and nightclubs district is within 4 km (2.5 mi). This hotel has a 3.50 star rating. Riu Palace Cabo San Lucas All Inclusive: Less than 3 miles from Cabo San Lucas downtown and marine, this 642-room resort faces Mdano Beach with views of the Arch and Lover's Beach. Exceptional service and courteous staff. This hotel has a 4.00 star rating. Question : What are the top attractions in Los Cabos? 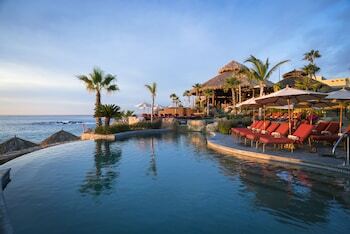 Answer : Los Cabos has over 46 points of interest for you to choose from. We suggest checking out Nikki Beach and Marina Cabo San Lucas first because they are the most popular attractions in Los Cabos. Don't forget about other highly recommended spots like Chileno Beach, San Jose del Cabo Art District, and Land's End. Get out there and see what the city has to offer on your trip to Los Cabos! Greeted by singing group. Security top notch. Location excellent. Cleanliness top priority. Service was impeccable. Loved our stay. Food was excellent . Everything was grand. Made you feel welcome.